Film Review: Mike Cahill's "Another Earth"
Home » death » film » review » Film Review: Mike Cahill's "Another Earth"
I have seen few really excellent science fiction films, and the ones I have seen have one crucial aspect in common. The new worlds they create make the viewer think about their own lives in a new light. Whether it's the somewhat dated (but still excellent) Altered States (1980), or more recent films such as Solaris (2002) and Moon (2009), the best sci-fi films all explore aspects of the human psyche. Thus, when I saw the trailer for Mike Cahill's Another Earth, I was quite excited, as I've always had a fondness for the idea of human life in other parts of the universe (not alien life), and I felt the idea of each of us having a doppelgänger somewhere in the cosmos, could lead to some interesting questions. The premise of the film is that another planet suddenly becomes visible from Earth. As years go by, the planet moves closer to Earth (not on a collision course, thankfully) and it becomes evident that it is an exact copy of the planet we call home. Even more interestingly, we soon discover that Earth 2 is home to the exact double of each and every human being on Earth. These bizarre circumstances act as the backdrop for the story of Rhoda Williams (Brit Marling), a promising young woman, who, after a night of heavy drinking and partying, becomes responsible for a fatal car accident, which kills Maya and Amos Burroughs. After being released from prison four years later, Rhoda ends up striking up a relationship with John Burroughs (William Mapother), after initially going to his house to apologise for killing his family. In the meantime, she has entered a competition to fly to Earth 2, in an attempt to escape her guilt. This is a subtle, well-made film, that captures the strange fear and curiosity that one presumes the circumstances would cause. Marling's performance is understated, and she plays 'subdued' extremely well. The development of the relationship between Rhoda and John is sincere, and is testimony to a well-written script. Interestingly, Marling actually began writing the film because she was tired of being offered parts as the attractive blonde girl in bad horror movies! 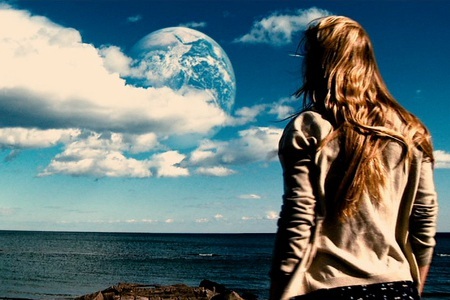 Another Earth offers an insight into the pain and suffering of loss. While, there is much left unexplored, in terms of what the reality of meeting oneself might actually be like, the film questions the lengths we go to in order to make amends, in a touching and poignant manner. It may not be as sci-fi as I expected it to be, but it is still a well made independent film, and worth a watch. I must also mention the fantastic scene with the saw, in which the suffering of both Rhoda and John comes to a poignant and moving climax. I was lucky enough to get a tweet from @SawLady, the woman responsible for the saw playing in this film, and who can be heard doing her remarkable stuff here. You can watch the trailer for Another Earth here.